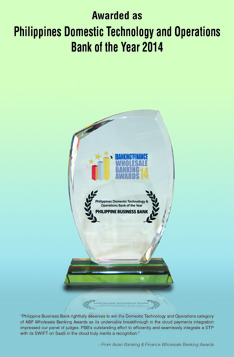 “The branch expansion has proven its merit given the strong growth of the loan and deposit business of the bank. The branch network expansion program has been met with delays due to difficulties in selecting attractive sites, coupled with the inclement weather which caused some construction delays in sites already chosen,” said PBB President and Chief Executive Officer Roland Avante. ₱5.0 billion in 2012 to almost ₱14.0 billion today. “I am confident that the branch expansion will continue to be a principal foundation of the bank’s sustained success and profitability. The business case for the expansion has been established and challenges will not deter us from reaching our goals. small and medium-sized enterprises located throughout the archipelago. We see dynamism in leading business centers outside the capital, and there are also up-and-coming provinces which have a lot of potential,” said Mr. Avante. PBB deliberately focused on the expansion of its branches in the countryside while moving the construction of branches in restricted areas to 2015. A projected eight (8) restricted branches are scheduled to be opened next year. The bank expects to reach 200 to 250 branches over the medium term. For the first nine months of the year, PBB’s pre-tax pre-provision profit was lower by 43.3% at ₱674.2 million and net income was lower by 52.0%, as the branch expansion and the uncertain trading environment caused a decline in earnings. However, interest income was up 30.2% from ₱1.60 billion to ₱2.08 billion, driven by loan growth. Loans increased 12.2% to ₱35.7 billion from ₱31.8 billion at the end of 2013. Interest expenses expanded by ₱59.9 million to ₱431.0 million, up 16.1% over the same period last year. Deposit liabilities increased 5.1 billion or 13.5% from end-2013. As a result, net interest income expanded 34.5% to ₱1.7 billion from last year’s ₱1.2 billion, an increase of ₱531.2 million. 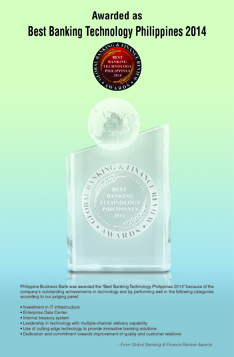 The strength of the bank’s core business underscores the bank’s strategic positioning to reinvigorate its lending and deposit-taking business. Core income net of operating expenses grew 112.0% or ₱372.3 million YoY, as the Bank continued to strengthen its position in the SME financing space.